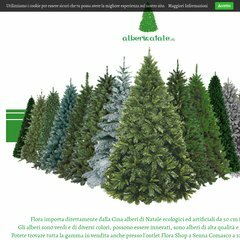 www.Alberinatale.ch - Alberi di Natale - Flora S.r.l. Mittels des Apache/2 Web-Servers wird sie von Brain Technology S.p.a (Toscana, Florence) gehostet. Ihre 3 Nameserver lauten dns1.playnet.it, dns2.playnet.it, & dns3.playnet.it. Die programmierte Sprache ist PHP/5.3.10-1ubuntu3.14.